Post War Years property survey templates incorporate sketches and phrases relating to specific Era problems and characteristics of these types and styles of properties. Post War Years properties often used new materials and building techniques and were built in an era when the National Building Regulations came into existence for the first time. Our Surveyors have been using our database of Post War Years survey reports which have been fine tuned and include many of our unique survey sketches. Download a Post War Years survey example below or call us for further examples. Our Surveyors have access to a vast database of survey sketches for every type, style and age of property including Post War Years. 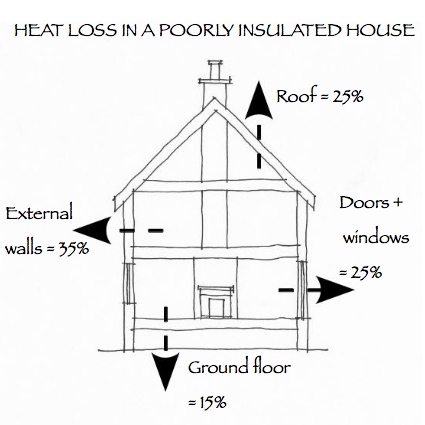 Typical problems with houses built in the UK during the Post War Years include lack of thermal efficiency which in shown in our adjacent sketch.